The Pole Strap shown above is made with a tough Polyurethane Rubber Pad sown to Heavy Duty Nylon Web. A Pole Strap is attached to the top of the Fly Section to allow the Ladder to be placed securely against a pole. The Pole Strap is sometimes called a Pole Becket or Leather Becket if it is made with leather. 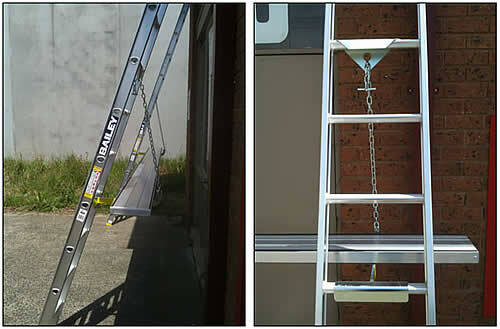 The Pole Chain shown above is fitted to a Branach Fibreglass Extension Ladder. A Pole Chain is attached to the top of the Fly Section to allow the ladder to be placed securely against a pole. Cable Hooks are used to allow users to rest the top of the ladder against a cable and work "mid-strand". These are predominantly used by the Telecommunications Industry. Titan Roof Hooks are made to make any Straight Ladder into a Roof / Ridge Ladder. Simply fix the "U" bolts provided to the top two rungs, roll the Ladder up the Roof and Flip over the Ridge. 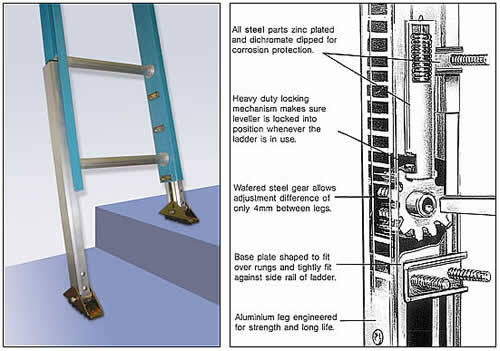 The Level-Eze Automatic Leg Levelling System suits Aluminium and Fibreglass Straight & Extension Ladders. It is ideal for stairs, gutters and other uneven surfaces or slopes, giving you up to 228mm of adjustment. The Black Adda Safety Ladder Leveller suits all Aluminium and Fibreglass Straight & Extension Ladders. It is ideal for stairs, gutters and other uneven surfaces or slopes, giving you up to 300mm of adjustment. To adjust, simply pull the Adjuster Pin out and set down the leg with Swivel Feet (in increments of 20mm). The Levelok Leveler Kit consists of four Levelok Quick Connect Bases and four Levelok Leveller Legs. Designed to be fitted to Ladders & Platforms which are to be used on uneven ground. Items can be purchased seperately except Quick Connect Bases which come in pairs. The Borsel SLE-800 Parapet Bracket is designed to extend from 130mm to 250mm in its normal position. By reversing the slider bar this bracket reduces from 130mm to 20mm. It comes with fittings to suit most types of Single / Straight and Extension Ladders. Three Wing Nuts clamp the Bracket to your ladder quickly and securely. When the SLE-800 is attached to the required rung and clamped, it becomes part of the ladder system. This allows it to be extended into its position for work to be carried out or to access the work area. Once the SLE-800 Gutter Bracket is clamped to the rung, no further adjustment is required. To remove from parapet, simply push ladder forwards and upwards. These Rubber Bumpers / Mittens have been designed to fit most Single / Straight & Extension Ladders. Rubber Bumpers help to reduce slipping as well as minimising damage to surfaces used on. They can be reversed to double the life of the product. Protects your gutter from scratches and dents. The LadderSafe Gutter Protector stops sideways ladder movement and protects the gutter edge finish. 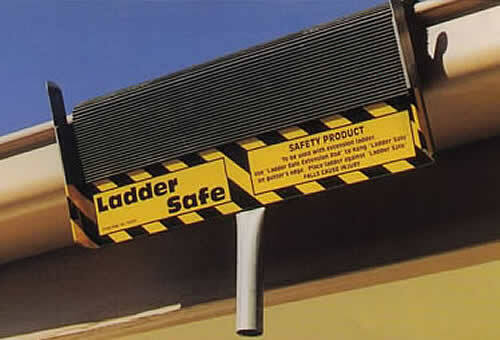 LadderSafe is made of a Steel and Heavy Duty Ribbed Rubber Construction and is easy to carry & store. 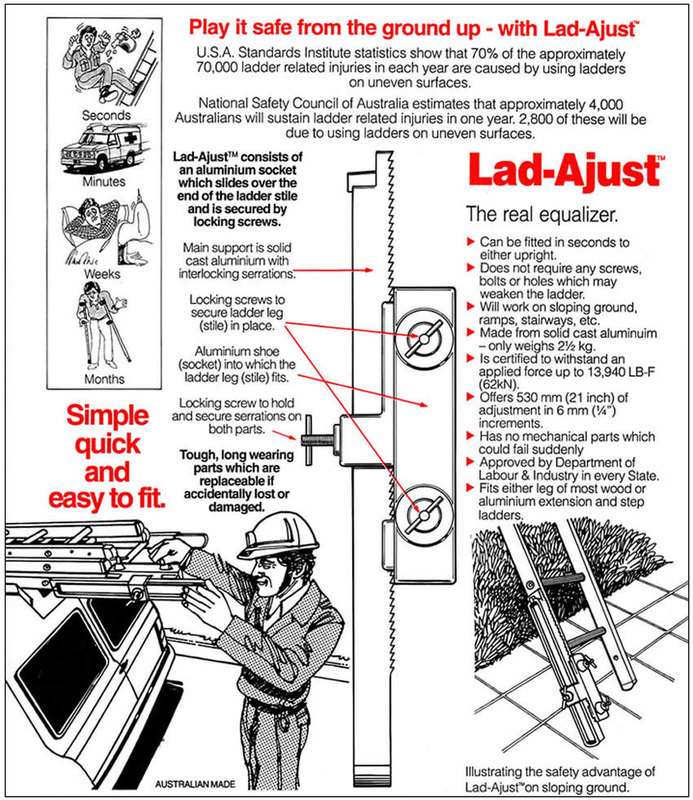 LadderSafe can be used on all types of sturdy mounted metal gutters. To use, lift LadderSafe into place along the gutter using an extension pole. 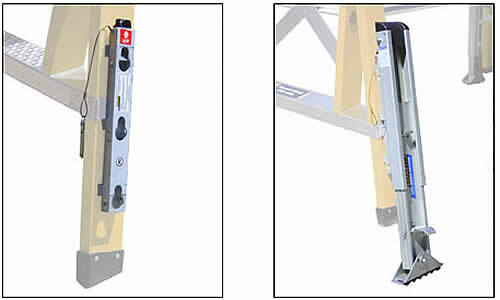 With LadderSafe in position, simply place the ladder on LadderSafe between the rests. On double storey applications, secure LadderSafe and your ladder by using a recommended strap with hooks that can be attached to the gutters leading edge. LadderSafe should be used every time you use a ladder against gutters. It is ideal for electricians, plumbers, tilers, metal roofers, TV repairmen, air-conditioning installers, painters and the home handy person. The Borsel SLE-700 Gutter Bracket is designed to fit most eave gutters. When the SLE-700 is attached to the required rung and clamped, it becomes part of the ladder system. Once the SLE-700 Gutter Bracket is clamped to the rung, no further adjustment is required. To remove from gutter, simply push ladder forwards and upwards. The Ladder Protector shown above is of a tough All-Rubber construction - One size fits all Ladders. Superior grip (Increases the surface area on the ground) - No metal on metal contact - Unique grip pattern. Works in the wet and is suitable for most surfaces like grass, wood, stone, concrete, tiles, etc. Dimensions: 660mm Long x 220mm Wide x 90mm High - Weight: 5.0kg. HoldSafe brackets can be used in a multitude of ladder safety applications where the ladder needs to be held at a parapet wall, base of a wall etc. It can be used for base secure points as well as gutter holding and protection. Can be attached to most step or extension ladders to create a safe working platform. The platform provides a flat standing area and a safety rail to prevent falls. Frees up both hands for the task at hand.